You will be met by our representative at the Airport and transferred to the hotel. Overnight at Hotel Radission/ Hyatt or similar. Sightseeing in Kathmandu City, Swayambhunath, Pashupatinath and Bouddhanath. Kathmandu City: Here you will visit the temple of the Living Goddess, who acknowledges the greetings of the devotees from the balcony of her temple residence. Kasthamandap - the source of the name Kathmandu and supposed to be made from the timber of a single tree and Durbar Square are with it's array of temples overlooked by the Hanuman Dhoka Palace, the ancient residence of the Nepalese Royalty. Swayambhunath: Located approximately 4 km/2.5 miles, this Buddhist Stupa is said to be 2000 years old. The Stupa, which forms the main structure, is composed of a solid hemisphere of brick and earth supporting a lofty conical spire capped by a pinnacle of copper gilt. Painted on the four-sided base of the spire are the all-seeing eyes of Lord Buddha. This hill is a mosaic of small Chaityas and Pagodas temples. Pashupatinath: Situated 5 Kilometers east of Kathmandu City, Pashupatinath Temple is one of the holiest Hindu temple dedicated To Lord Shiva. Situated amidst a lush green natural setting on the bank of the sacred Bagmati River, the temple built in pagoda style has gilded roof and richly carved silver doors. Visitors will be permitted to view the temple from the east bank of Rivers Bagmati, entrance in the temple being strictly forbidden to all non-Hindus. Pashupatinath is the center of annual pilgrimage on the day of Shivaratri which falls in the month of February / March. Behind the temples are the cremation grounds. Boudhanath: This Stupa, eight kilometers east of Kathmandu City is one of the biggest in the world of its kind. It stands with four pairs of eyes in the four cardinal direction keeping watch for righteous behavior and human prosperity. King Man Dev built this Buddhist stupa at the advice of Goddess Mani Jjogini. It is built on an octagonal base inset with prayer wheels. Houses of Lamas ring the shrine or Buddhist priests. 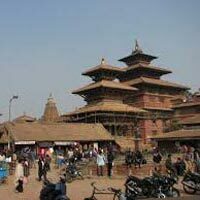 Patan: It is 5 km / 3 miles away from Kathmandu City. Patan also known as Lalitpur is the city of fine arts, enclosed within 4 stupas said to be built in 3rd century AD, by Emperor Ashoka. 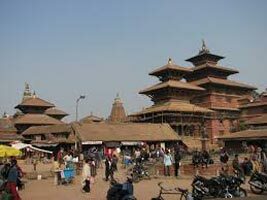 You will see the Durbar Square, the Patan Durbar which houses a bronze collection, the Krishna Temple built by King Siddhi Narsingh Malla, Hiranya Varna Mahavihar and Mahaboudha Temple. A trip to The Tibetan Refugee Camp and the Handicraft Center will also be done while visiting Patan, where you will witness the hand weaving of Tibetan carpets and molding of metal statues. Bungamati: A typical Newari Village, lying 11km / 7 miles south of Kathmandu, founded in 7 the century AD, possesses one of the most important God of Kathmandu Valley known as Matsyendrantha - the God of Rain and compassion, worshipped equally by Hindus and Buddhists. He was accredited by the people for introducing rice plantation in the valley. A tour of this village combined with Khokana imprints, a beautiful impression on the visitors mind through it's set up and primitive way of living. Khokana: Khokana is a small Newari Village on the Southern Flank of Kathmandu Valley and about 11km/7miles from Kathmandu City established in 7th century AD by the mighty Licchhavi rulers of Nepal. It is a unique village in the whole of Kathmandu Valley because of its aloofness from modern civilization. Today morning you will transfer to the airport for your onward flight.